Rotterdam, September 21, 2018 – Although most contractors still buy the majority of their products and materials at the wholesaler, the direct channel is a channel that gains importance as well. This is especially the case for the larger-sized contractors (16 employees and more). However, it also plays an important role for the mid-sized contractor (6 up to 15 employees). This is one of the results of the European Contractor Monitor 2018 of USP Marketing Consultancy. In this research 1,100 contractors with at least 6 employees in eight countries were asked about the importance of the various purchase channels to their business. Currently, the traditional way of ordering is still the dominant way: through the wholesale (either general builders merchant or specialised builders merchant). Every 9th contractor out of 10 uses this channel. Although we see that there are differences amongst the 8 countries, at least 80% of the contractors in each country purchases the traditional way. Belgium has the highest share of wallet for the wholesale. This can be explained by the fact that Belgium still has a lot of mum and dad-companies in the construction sector, i.e. small (family-owned) contractors and builders merchants having a single outlet for building materials. One might ask what other channels contractors use. USP Marketing Consultancy investigated three other purchase channels: directly at manufacturer, DIY stores and pure online web stores. It turns out that at least two thirds of the contractors also buy directly from the manufacturer, making this channel a serious threat to the traditional wholesaler. When comparing the two types of contractors we see that especially the larger contractors (16 employees and more) use the direct channel (71% versus 58%). When looking from a country perspective we see that the direct purchase channel is used most often in Germany, Italy and Spain. Although the share of wallet of directly purchasing from the manufacturer is only half of the share of wallet of the wholesaler, it can be expected that this gap will decrease in the coming years. USP asked all the contractors for each channel whether they would buy more or less from each channel. 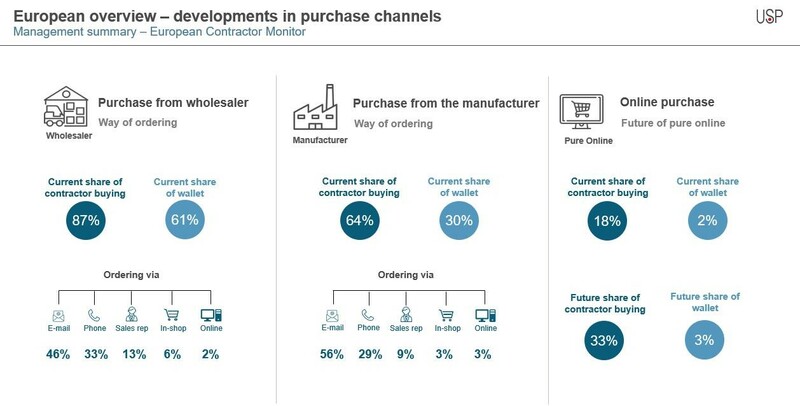 Looking at the amount of contractors, the majority still thinks they will be buying the same amount from each channel. However, we see the highest expected increase through the direct approach, 18% of the European contractors expect to buy more from the manufacturers (2% expect to buy less). To put these figures above in perspective: 11% of the European contractors expect to buy more from the wholesalers (6% to buy less). So, in the end the balance favours the direct purchasing from the manufacturer. The Netherlands, Belgium and Italy show the highest expected increases from the manufacturers. On top of that, the Netherlands is also the only country where we see a negative balance for the wholesalers (more contractors expecting to buy less than contractors expecting to buy more). Buying from the wholesalers is still the most common channel for contractors. However the majority already buys from the manufacturer as well, only its share is not as big as the one of the wholesale. 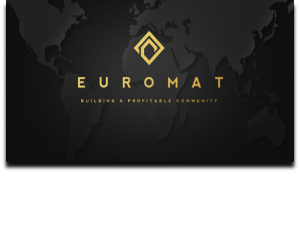 In the upcoming years, we expect that the manufacturers’ share will increase, since many contractors state that they will buy more via this channel. This will be at the cost of the wholesalers, as the other two purchase channels (DIY and pure online web stores) don’t play a major role (yet). There are a few reasons leading to this change. First, all contractors show positive turnover developments meaning that – in theory – they can show continuity in their planning process, making it easier for manufacturers to plan as well. The manufacturers don’t want to worry too much about stock, that was one of the traditional roles of the wholesalers (keeping products in stock). Secondly, contractors become more professional, so they are more reliable clients for manufacturers as well; both in ordering and paying in time. Finally, the digitalisation has made it easier for the contractor to buy from the manufacturer. Majority of the sales are done via email, so the next step of ordering via applications (either on a phone or on the website) is not that far away. USP Marketing Consultancy is a leading international market research agency that is specialized in the construction, installation and DIY sector for over 25 years. USP Marketing Consultancy works for internationally renowned companies, such as Saint Gobain, Knauf Insulation, AkzoNobel, VELUX, Philips, Grohe, Forbo, etc. Our clients often have pan-European questions about their brand awareness, customer journeys, market opportunities, e-commerce trends and other research needs. USP Marketing Consultancy delivers the insights to make decisions and acts as a marketing advisor for its clients.